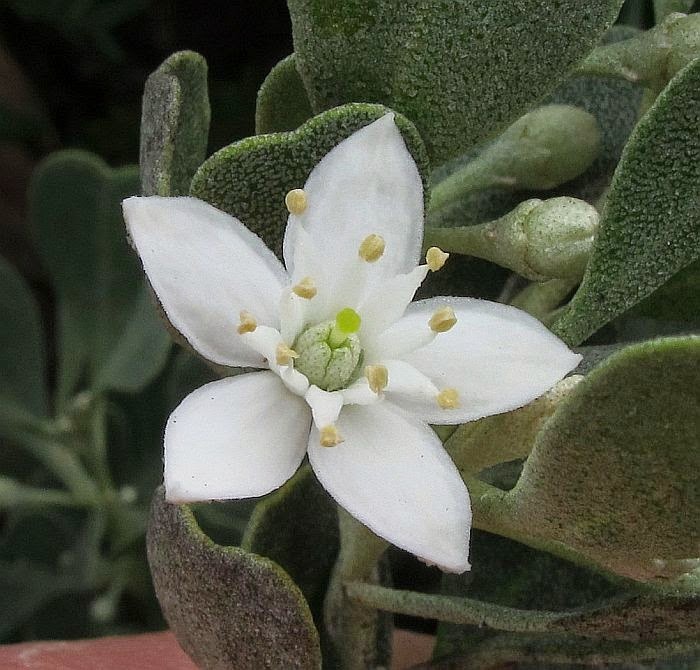 Silver grey foliage is not particularly unusual in hot dry regions as it is means of deflecting the sun’s rays, however most have this colour due to long silky hairs, whereas Rhadinothamnus rudis uses silvery scales (lepidote), which cover all except for the inner parts of the flower. 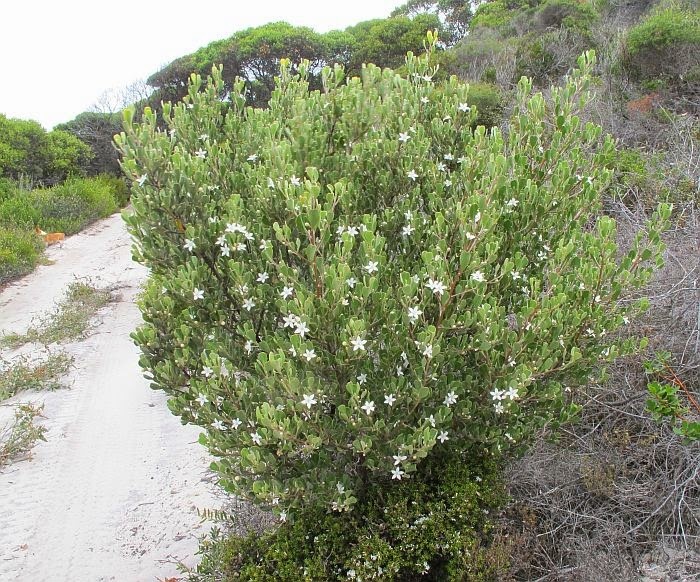 This handsome shrub growing to 2 metres (6’6”) in height (although usually half that size), is a very tough plant often growing within sight of the sea and in a highly reflective white sand over limestone. 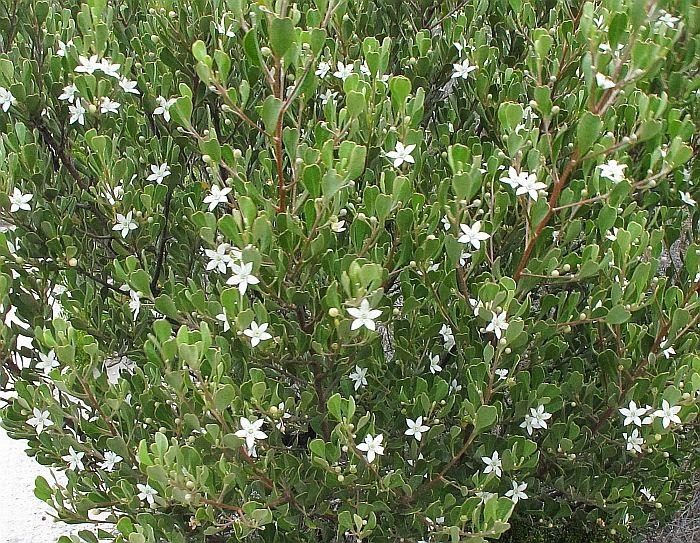 It is another WA endemic and mainly found in coastal districts between Ravensthorpe and Albany, where here it extends inland to the Kulin area. In the Esperance region it is common around Quagi Beach, 55 km (35 miles) west of Esperance. Rhadinothamnus rudis was previously known as Phebalium rude, but was separated from that genus due to some structural anomalies, and was placed along with two other species into this new genus. At the same time R. rudis was divided into three subspecies, the others being subsp. amblycarpus and subsp. linearis, of which subsp. linearis is rare and restricted to the Mt. Ragged region, although subsp. amblycarpus is more common and overlaps with subsp. rudis. Rhadinothamnus rudis subsp. rudis differs from subsp. amblycarpus by the leaf shape and the ovary. 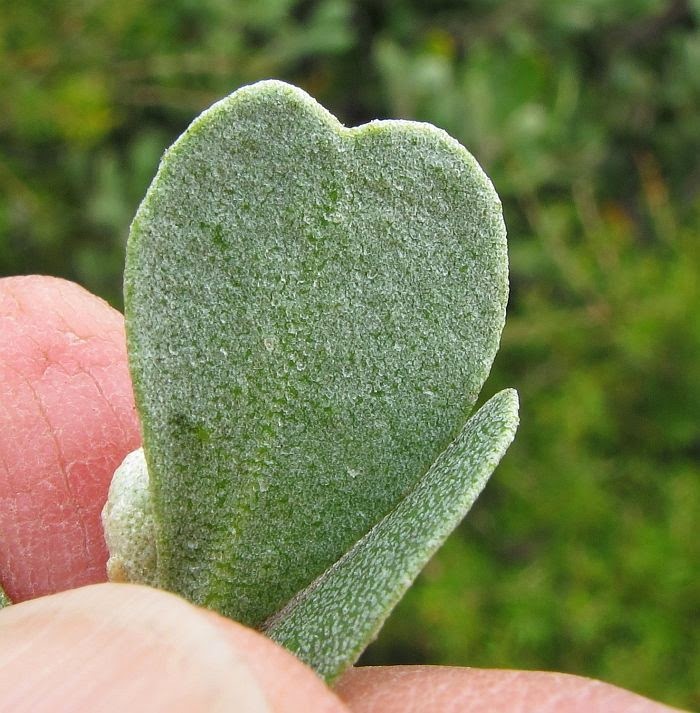 The heart shaped leaves of subsp. rudis is replaced in subsp. 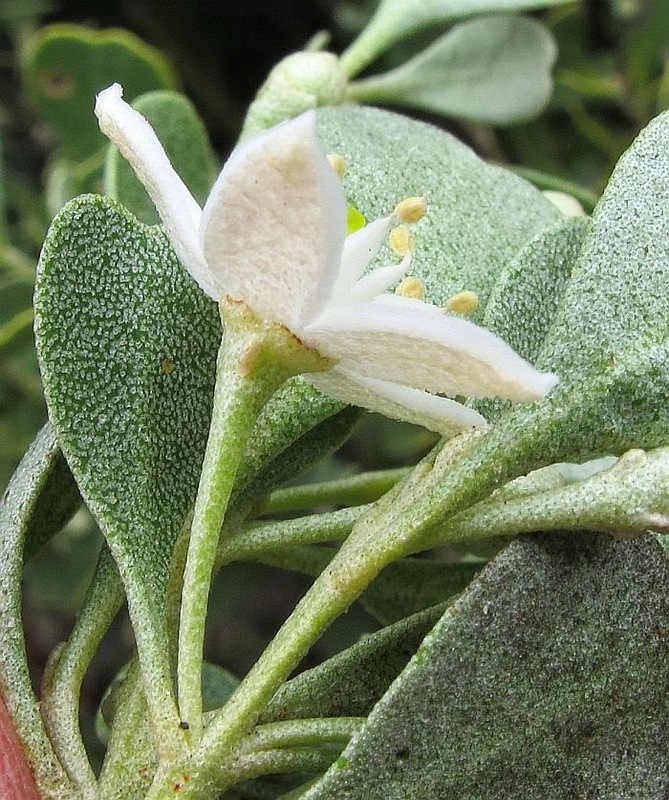 amblycarpus by more narrow and wedge shaped leaves (although still bifid); the more important difference however is with the ovary, which is covered with scales (lepidote), whilst subsp. amblycarpus has none (glabrous). 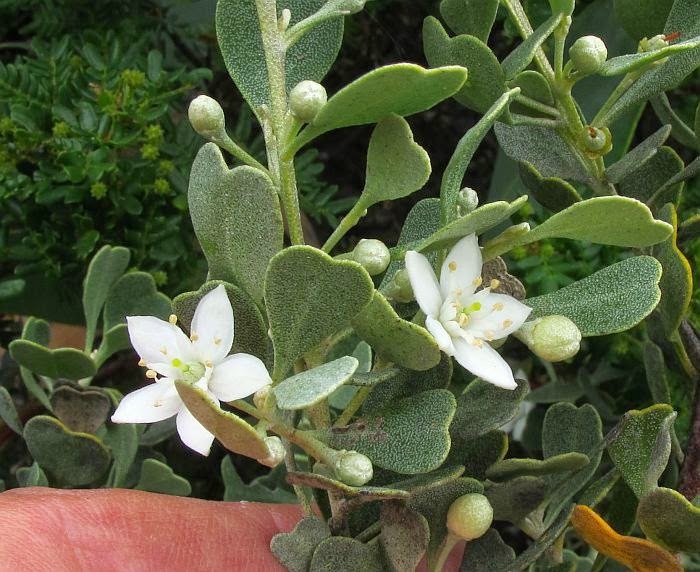 The white flowers are over a centimetre (1/2”) diameter and have a thin upturned edge; these are produced at almost anytime of the year, depending on local weather conditions, although locally the main flush is in the summer/autumn period. Nuytsia Vol 12. No 2. 1998. 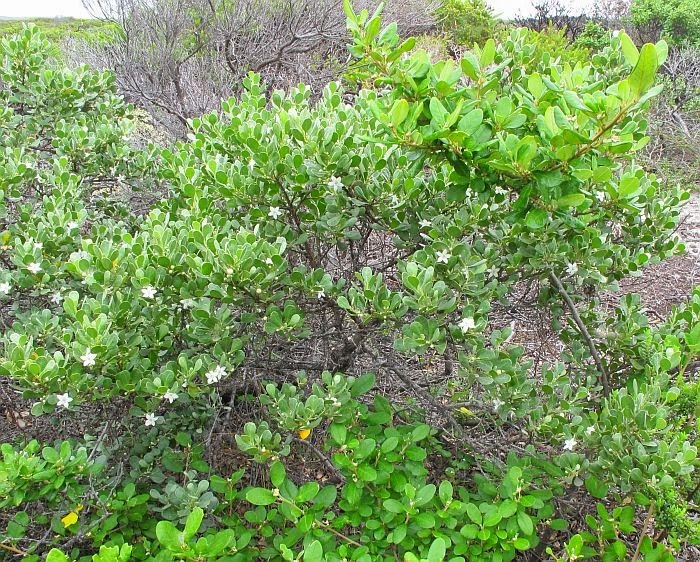 New species and nomenclatural changes in Phebalium and related genera (Rutaceae). Rhadinothamnus is part of the Rutaceae family.